Later, living in Manhattan, Singer worked in the garment industry, but maintained his hankering for traditional Jewish deli fare. After two decades, he finally took his grandmother’s oft-repeated advice about doing what made him happy. He spirited out of the city to study at the Culinary Institute of America and then left the country entirely to live, work, travel and, most importantly, eat throughout Italy. While cooking as the head chef at the US consulate in Florence, he met DC celebrity-chef Jose Andres, who invited Singer to work for him here in Washington. Upon arrival in the District, Singer had two questions: where to live and where to find a good sandwich. Even with the hot real estate market, the latter question proved much trickier. While he was able to find employment as a chef at several locations around the city, the corned beef question continued to bedevil Singer. So he began doing what any fine meat aficionado would do: crafting and curing at home. Friends and family subjected themselves (fairly willingly) to taste tests. Never fully satisfied, Singer happened upon a unique way to cure his meat using a completely natural alternative. Most meat purveyors, he says, utilize a synthetic curative. Singer, however, makes use of celery juice powder, which contains naturally produced nitrites, the critical curing ingredient. Six hundred pounds of brisket later, a new and all-natural recipe was born. Ever protective of his proprietary blend, Singer shares the ingredients, but not the proportions, of his masterpiece solution: they include salt, sugar, honey, pepper, coriander, garlic, chili flakes, allspice and bay leaf. As a next step, Singer tried to find producers who would help make his meat, but he realized that he could prepare it better than anyone. Like Debbi Minkoff Miller of Banana Love Muffins, Singer now rents space at Union Kitchen, the full-service, fully licensed food incubator in Northeast Washington. Comfortable in his own corned-beef corner, Singer continues to perfect his recipe as a small-batch operation. He uses only local providers and suppliers for spices and meat and cures everything by hand. What’s so significant about this meat maker? Besides the talented men behind the operation (Doug and his business partner, Peter Smith) and the ingredients, Doug truly produces traditional meat with a twist. 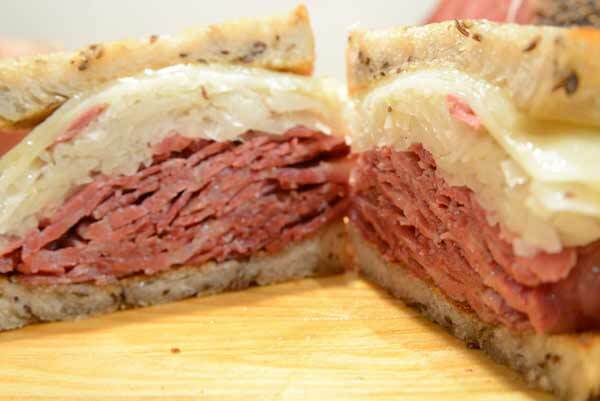 His deli favorites, corned beef and pastrami, were known as the poor man’s meat, traditionally sourced from less sought-after cuts. But from these humble origins, each piece of Singer’s meat receives ten loving days of production. “Time is the critical ingredient” in this old-school-style process, Singer says, noting that most commercial production is done in three swift days, without detail-oriented care. Singer’s Significant Meats doesn’t cut corners—except, perhaps, a little slice on the side for you to sample. Evan Caplan hails from the second Jewish homeland: New York. After a stint in the Peace Corps, he settled in the District and loves calling this fascinating slice of America home. He’s a travel and food writer when not at his day job working in international development.